Ephemeris for Friday, December 21st. The Sun will rise at 8:16. It’ll be up for 8 hours and 48 minutes, setting at 5:05. The Moon, 1 day before full, will set at 7:56 tomorrow morning. Today is the shortest day of the year, well in daylight hours. The Sun will be up for only 8 hours and 48 minutes in the Interlochen/Traverse City area, 8 hours 53 minutes in Ludington, and 8 hours 40 minutes at the Straits. This is because the northern end of the Earth’s axis is pointing some 23 and a half degrees away from the Sun. Or it will at 5:22 this afternoon, the instant of winter solstice, when winter will begin. To find how high the Sun will get in the south at local noon take 90 minus your latitude and subtract also 23 and a half degrees. For Interlochen that’s 21.8 degrees above the southern horizon. We’re not getting much heat from the Sun. But as winter progresses the rising Sun will slow the cooling and begin to warm us up before spring. 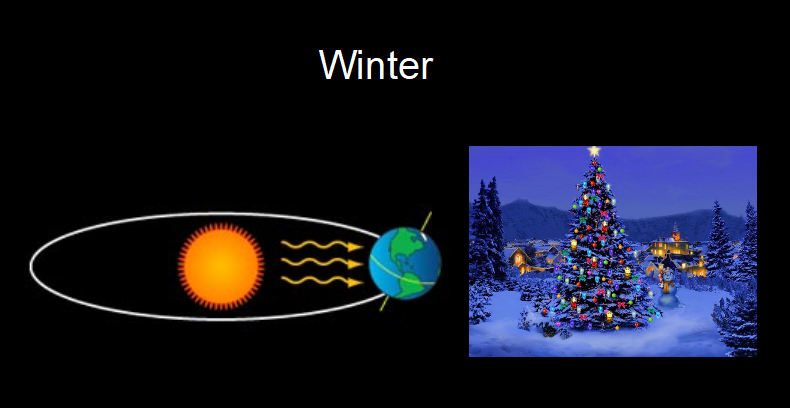 The Earth and its axis on the first day of winter, the winter solstice. From my Sun and the Earth talk slides. 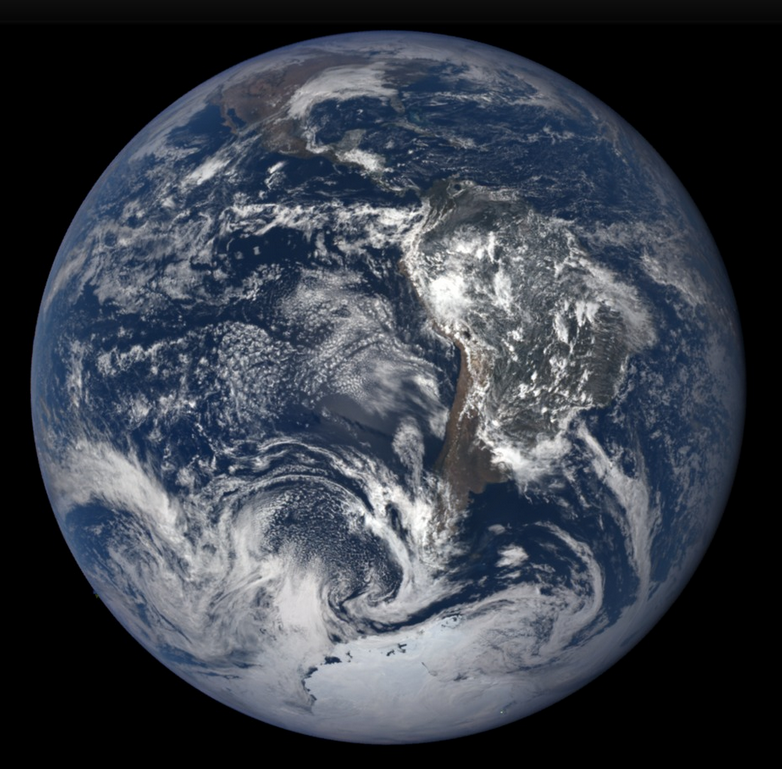 DSCOVR satellite’s Earth Polychromatic Camera image of the Earth at 18:09 UTC (1:09 p.m.) December 19, 2017. We’re way up at the top just under the clouds at the top. It was actually partly cloudy that day. The DSCOVR satellite was in a halo orbit about the Earth-Sun Lagrange L1 point, 934,498 miles (1,503,929 km) toward the Sun from Earth. 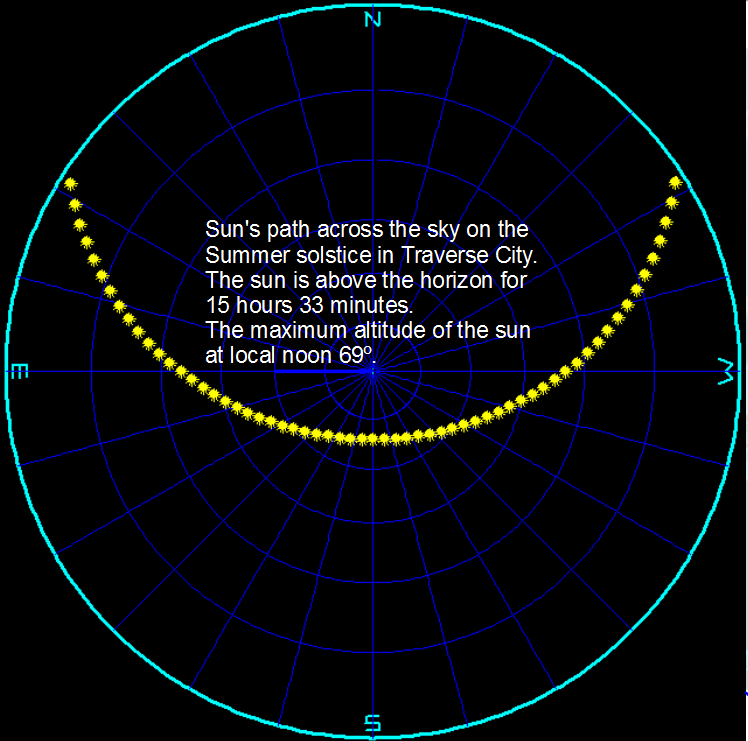 Comparing the sun’s path at the summer and winter solstices for Interlochen/Traverse City. This is a stereographic representation of the whole sky which distorts the sky and magnifies the size of the sun’s path near the horizon. Ephemeris for Tuesday, June 26th. Today the Sun will be up for 15 hours and 33 minutes, setting at 9:32, and it will rise tomorrow at 5:59. The Moon, 2 days before full, will set at 5:42 tomorrow morning. Today is the day of the latest sunset, at least for around latitude 45 degrees north. It will be within the same minute for the next 5 days, before it retreats. By the end of July sunset will be at 9:09 p.m. 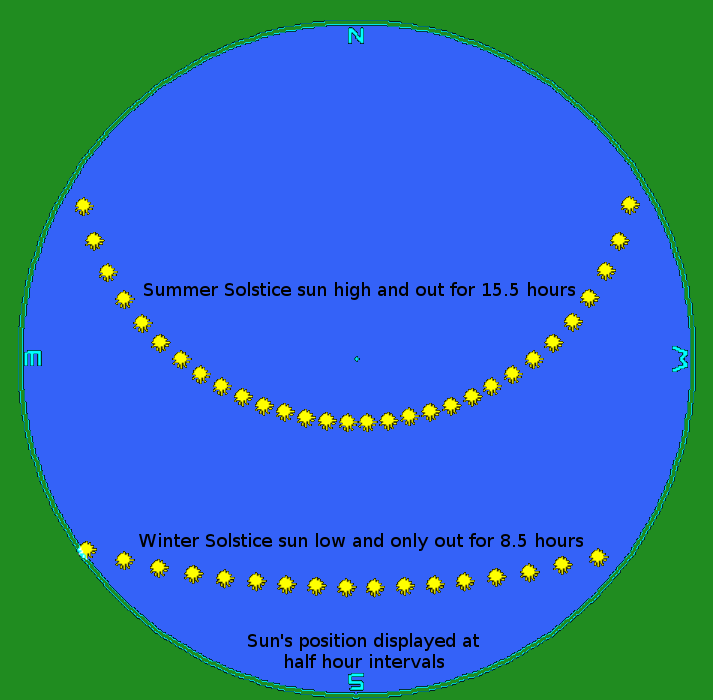 The lopsidedness of the dates of earliest sunrise and latest sunset is caused by two factors. The Sun’s high latitude or declination above the equator, which makes it appear to move faster, countered in the summer by the fact that the Earth is almost at its farthest from the Sun, which makes it appear to be slower. These effects are why sundials don’t keep proper clock time without the adjustment of the equation of time to the readout, or fancy sundials that take that into account. 06/21/2018 – Ephemeris – Yay, summer is here! Ephemeris for Thursday, June 21st. Today the Sun will be up for 15 hours and 34 minutes, setting at 9:32, and it will rise tomorrow at 5:57. The Moon, 1 day past first quarter, will set at 2:57 tomorrow morning. Welcome to summer! It began at 6:07 this morning. If you remember back to winter and the beautiful constellation of Orion. Some folks could trace the club he was holding over his head off the red star Betelgeuse. The Sun now appears above that. If you remember Gemini the twins, well the Sun is off Castor’s big toe. That’s all pretty high in the sky and giving us 15 hours and 34 minutes of daylight. That’s why summer’s so hot. This despite the fact that in two weeks we will be the farthest we get from the Sun all year. The 3 million mile difference in the Sun’s annual distance is peanuts compared to the seasonal fluctuations caused by the tilt of the Earth’s axis. The Sun with its position with the stars at the summer solstice, June 2018. Click on the image to enlarge. 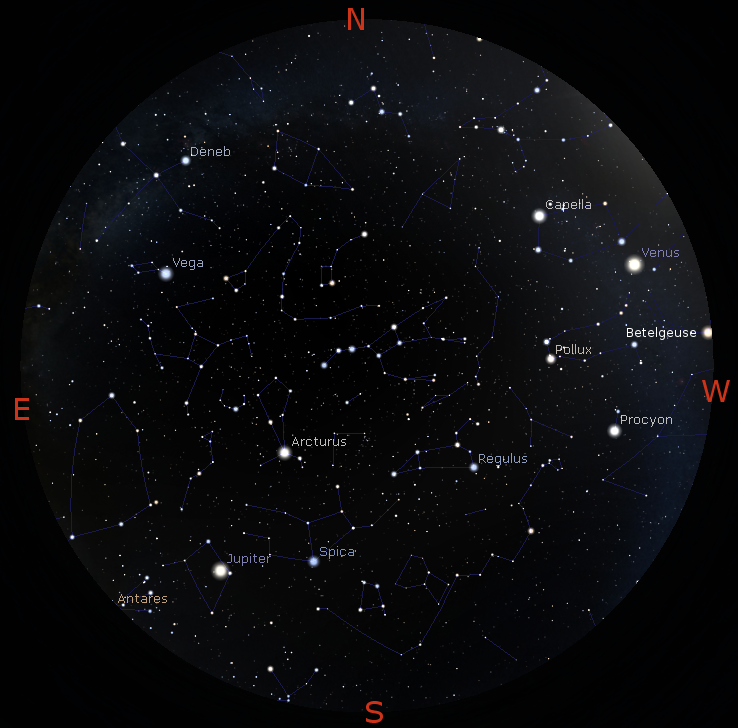 Created using Stellarium and GIMP. The sun’s daily path through the sky from horizon to horizon on the first day of summer, the summer solstice. Grid lines are 15° apart. The Sun os plotted at 15 minute intervals. Credit: My LookingUp program. 03/20/2018 – Ephemeris – Spring begins later today! 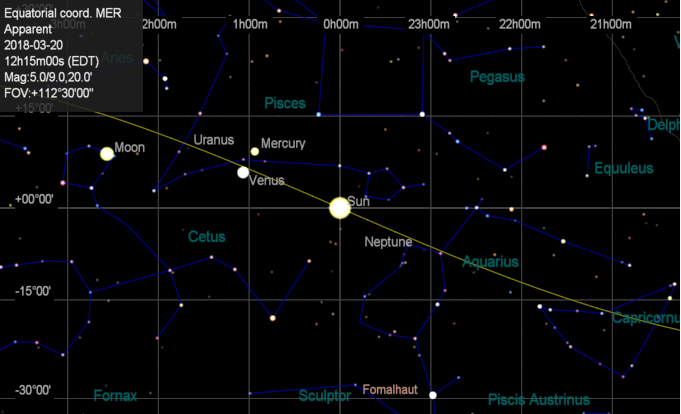 Ephemeris for Tuesday, March 20th. The Sun will rise at 7:45. It’ll be up for 12 hours and 9 minutes, setting at 7:55. The Moon, 3 days past new, will set at 11:30 this evening. At 12:15 p.m. the season of spring will begin. It may or may not feel it in our neck of the woods, but astronomically at that time the Sun will appear to cross a point in the sky called the vernal equinox. Equinox means equal night, when the Sun is up for 12 hours, and set for 12 hours. It does, if you don’t look too close, and in the old days clock weren’t that accurate anyway. The vernal equinox is the point in the sky where the Sun crosses the celestial equator, which is above the Earth’s equator heading north. The North Pole will begin 6 months of daylight, while the rest of the northern hemisphere will bask in more than 12 hours of sunlight a day. The reverse is true in the southern hemisphere where autumn will start. The Sun at the vernal equinox point in the sky at 12:15 p.m. EDT (16:15 UT) March 20, 2018. That point is the starting point in measurements on the celestial sphere. 0 hours right ascension, 0 degrees declination. The yellow line is the ecliptic, the plane of the Earth’s orbit and the apparent path of the Sun, whivh moves about one degree per day from lower right to upper left. Created using Cartes du Ciel (Sky Charts). 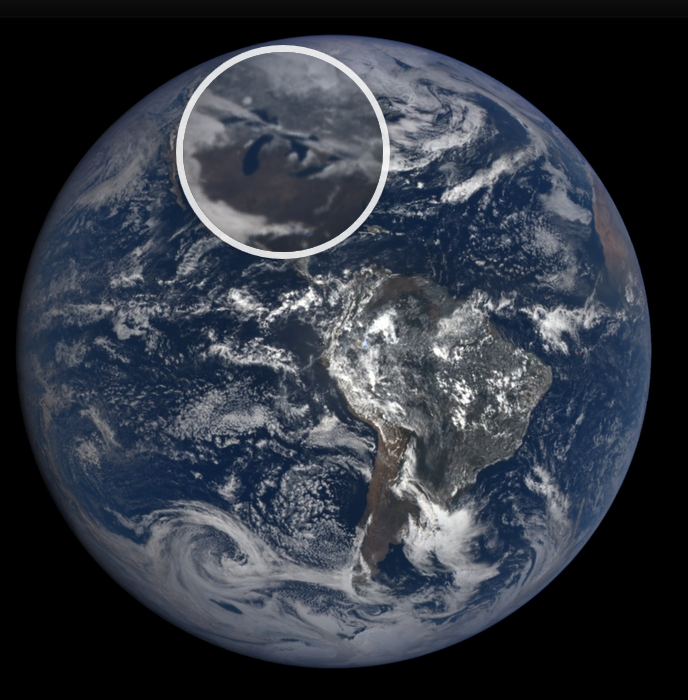 The Earth from 2 days before the vernal equinox, with the north pole not quite in sunlight. I’ve added a magnifying spot showing Michigan. The white stuff fringing the upper part of the Michigan mitten is snow. It was a rare clear day Saturday when this image was taken. Credit NOAA/NASA/DSCOVR satellite/EPIC camera. The DSCOVR satellite was 914,903 miles (1,472,394 km) sunward of the Earth at the time of the image. The satellite is in a halo orbit of the Lagrangian L1 point between the Earth and the Sun.